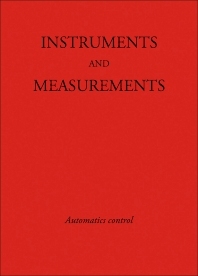 Instruments and Measurements: Automatic Control documents the proceedings of the I&M Special Section on Automatic Control (I & MAC) held in Stockholm, Sweden on September 17-18, 1964. This book discusses the method determining process dynamics; identification of stationary time series; and optimum nuclear rocket start-up to develop full power at exact time with consideration of noise. The principle of servo-pendulum of long natural period and its application; autopilot system for hydrofoil seacraft; and temperature gradient control in thermal conductivity determinations are also deliberated. This text likewise covers the instrumentation problems involved in the measurement of the transient response of a hydraulic servomechanism; modified cartesian manostat for precise differential pressure control; and oscilloscope sweep circuit. This publication is beneficial to engineering students and researchers intending to acquire knowledge of automatic control.